Popular new cheer uniform features unique embroidered star design on shell & skirt. Made of 100% double knit polyester with three stripe braided trim in white sparkle with metallic silver. Shell has an asymmetrical neckline in front & back and skirt includes a stylish v-notch on right thigh. Back is solid color. Cheer Shells do not include lettering. Add 1 color tackle twill lettering for $6.50 or 2 color twill for $12.00. Use Cheer Lettering link below to choose lettering style. Womens XL 31-33" 39-41" 15"
Use our easy order Cheer Roster and we will label your cheer packages for each girl - no sorting on your end! Simply list each girl's name and her shell size first, then her skirt size. Use GS for Girls Small and WM for Womens Medium, for example. Or, you can use the roster to simply list the number of each size you want, for example 6 GS, 7 GM, 4 GL, etc. Order early, sizes may sell out. 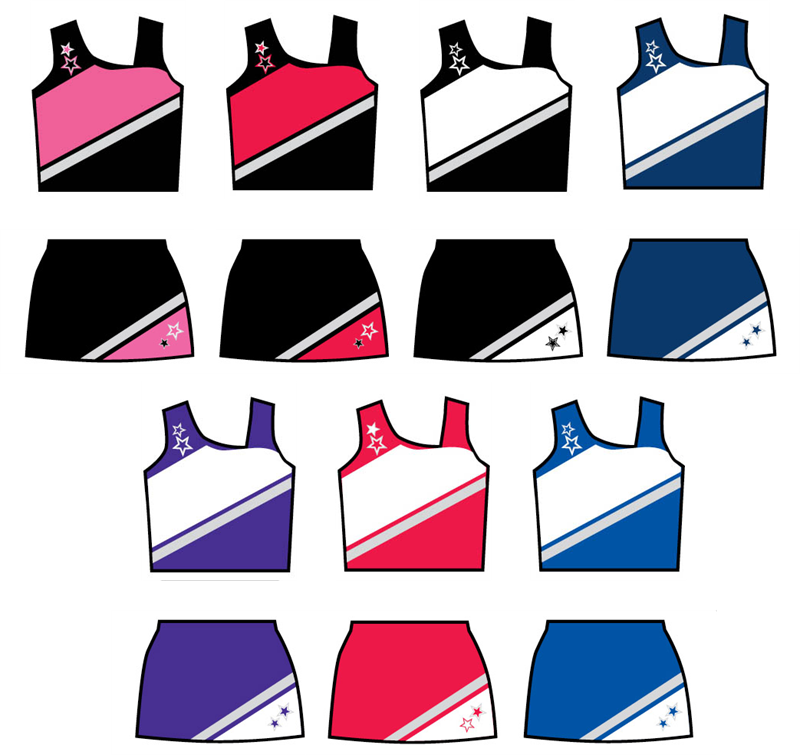 If there are any backorders on your order, we will email you within 1 day to see if any changes in your order need to be made to outfit your girls in time for your season.